I've been remiss in reviewing last week's Incredible Hulks due to lots of other things happening. So this week, you get a two-in-one review, with Greg Pak & Tom Grummett's issue, followed in swift succession by Jeff Parker & Gabriel Hardman's Hulk. Can it get any better, folks? "Live and Let Smash," part three of the latest storyline, "The Spy Who Smashed Me," continues the James Bond-inspired globetrotting of previous chapters while upping the ante with more mythological underpinnings as in recent issues. 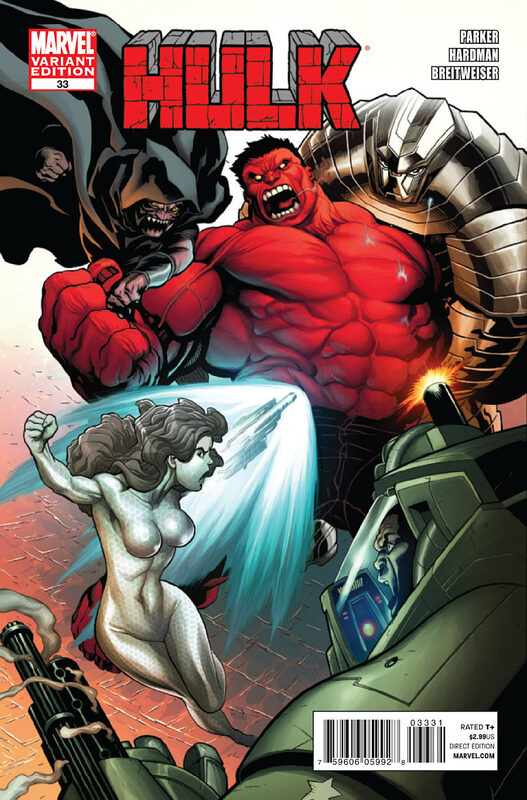 The MacGuffin of the piece, Pandora's Box, continues to play a central role, with other agencies attempting to claim it, kidnapping both Tyrannus and Dr. Di Cosimo and leaving Hulk and Red She-Hulk to pursue them while sorting out their own issues. It's an intriguing imbroglio that's surprisingly lighthearted for a Hulk tale. Greg Pak deserves a lot of credit for switching gears in his waning days on this series. In some ways, the stylistic shift reminds me of the kinds of stories Peter David used to tell using the merged Hulk incarnation of the early #400s. Such stories, often imbued with David's trademark off-center sense of humor, would in theory fail to work in the Hulk's tragic milieu. 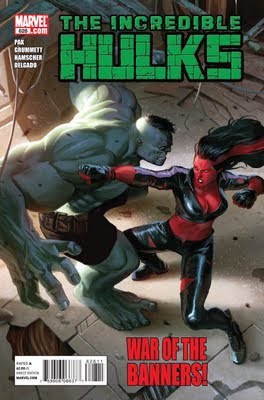 Yet, here we have another gifted writer, who opted to stay with the Banner/Hulk dichotomy, not only giving us another lighthearted romp, but making it look easy. Kudos, Mr. Pak. And playing up the ties between the Knights of Rome and recent foes, leading to a priceless exchange involving Tyrannus, Cho and the Hulks? Priceless. Once again, Tom Grummett and Cory Hamscher do a slam-bang job with the art chores this issue, telling the story clearly and stylishly. Edgar Delgado's colors match the light tone of the script. It's a terrific package, made all the more surprising by the fact that the creators stuffed all this excitement into just 20 story pages. Conversely, that's also one of my only complaints about the issue. (The other is more about the arc's lack of covers appropriate to the story inside.) But then again, if cutting two story pages saves readers a whole dollar, then it's hard to dispute the point. Overall, there's still plenty to recommend this issue and series. Another month passes, and Jeff Parker and his merry crew again step up to the plate and present another solid issue of the series that just over a year ago was being decried as a blight on the legend of the Hulk in the Marvel Universe. Since taking control in issue #25, Parker, Hardman & Breitweiser have delivered well-hewn stories month in and out, and this issue is no different. 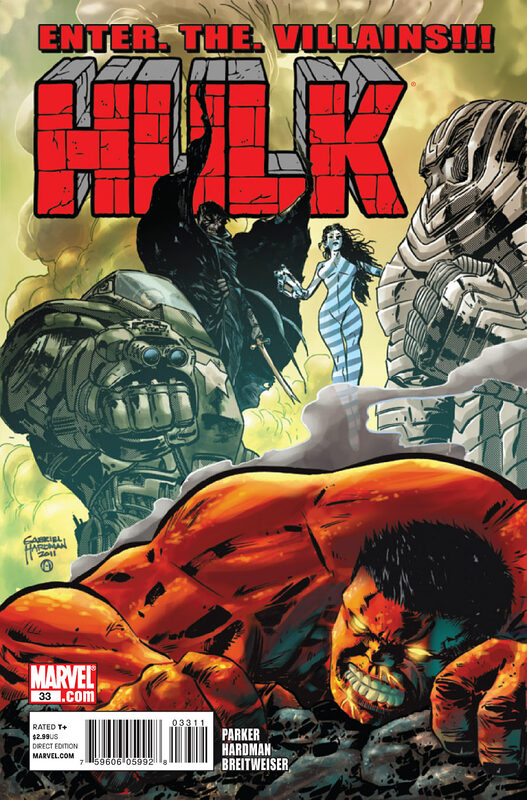 Unlike last issue, the Red Hulk has a meatier part to play at the center of this narrative. He's weary from being unable to rest, hounded by General Fortean, to the degree that he's an easy target for Zero/One's new minion, Black Fog. While making for a terrific action sequence, Parker's plot nonetheless highlights an increasing problem with the character--namely, his unfortunate position of always playing defense. He's being attacked from all sides, unable to shape a plan of his own to overcome his obstacles. And that's a failing that echoes his green-skinned progenitor in the 1970s. Maybe it's the point Parker's trying to make, but if it goes on too long it has the consequence of belittling the title character. 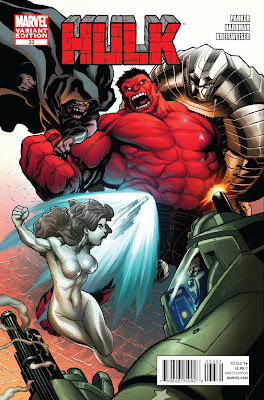 I'm hoping Red Hulk gets the chance to strike back soon. In the art department, Gabriel Hardman and Elizabeth Breitweiser continue to impress. The Red Hulk's battle with Black Fog is stunningly drawn by Hardman, and Breitweiser's colors establish the proper mood. I love the stylistic choices Hardman uses month in and out, employing a solid design sense, easy-to-follow layouts, and tools that very few other artists deign to use (screentone!) in order to produce a unique, dynamic look. My only regret is that we won't see this team together again until issue #39 (!) due to the upcoming biweekly schedule. Hulk #33 continues the upward trend of this series, which may yet eclipse the terrific storytelling of its sister title. It already often exceeds the other book's fun quotient, in spite of having a protagonist not many fans liked upon his introduction. Quick Verdict: A close call, but with four villains, a complex ongoing plot, and our Crimson Crusher, in spite of my misgivings about the Red Hulk's role, I'll say Buy It. Great reviews, Gary! I especially enjoyed Incredible Hulks #628, which was just pure awesome and highly entertaining. I honestly can't wait until the conclusion to The Spy Who Smashed Me storyline, if only because we're getting Heart of the Monster! By the way, will you be reviewing Skaar: King of the Savage Land #3? My comic store won't have it in until next week, so I would really appreciate it if you would review it. Glad you liked the reviews! I'll be reviewing Skaar #3, I just have to wait until my weekly comic shipment arrives since it's in there. Also expect a review of Alpha Flight #0.1 and some other stuff. Sweet! I'll be looking out for your reviews of both Alpha Flight #0.1 and Skaar: King of the Savage Land #3! While I admit that Granov's cover was pretty cool, I must also admit that Pelletier's cover for Incredible Hulk #635 featuring World-Breaker Hulk looks epic beyond words! I even made it my official screensaver! Keep up the great work, Gary!